It’s rare that Thee Faction would ever take you to a link on the internet, as there’s something suspiciously bourgeois about farting around on YouTube etc, but this is definitely impressive. It’s a lovingly created (if not visually spectacular) collection of MP3s of L’Internationale in 40 different languages! 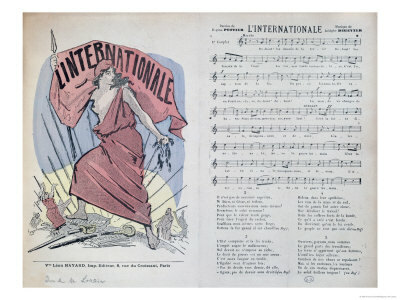 L’Internationale is the song which became the anthem of Socialism. It’s a sing-a-long classic. The original French words were written in June 1871 by Eugène Pottier (1816–1887, previously a member of the Paris Commune) and were originally intended to be sung to the tune of La Marseillaise. Pierre De Geyter (1848–1932) set the poem to music in 1888. His melody was first publicly performed in July 1888 and became widely used soon thereafter. In 1944, the Soviet Union adopted the song as its national anthem, with a slight twist in the Russian translation, the song became the Anthem of the Soviet Union. The traditional British version of it is usually sung in three verses, while the American version, authored by Charles Hope Kerr with five verses, is usually sung in two. The American version is, strangely, sometimes sung with the phrase “the internationale”, “the international soviet”, or “the international union” in place of “the international working class”. In English, the traditional pronunciation is not an imitation of the French – instead we tend to rhyme “Internationale” with “valley”. The English-language version is a bit tricky to sing, as the lyrics may appear sometimes forced and unnatural, as we’re so used to the lingua franca of pop. Billy Bragg, after a meet with American singer Pete Seeger, agreed that the old lyrics were a bit “archaic and unsingable”. Bragg composed some slightly revised verses for the song, based on the British version. The recording was released on his album The Internationale.